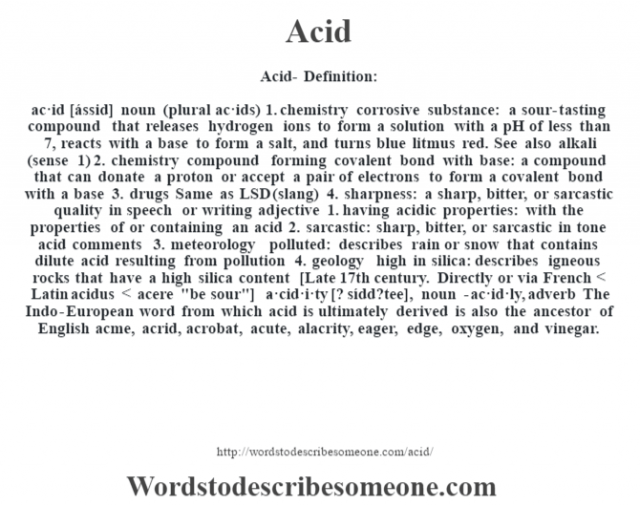 ac·id [ássid] noun (plural ac·ids) 1. chemistry corrosive substance: a sour-tasting compound that releases hydrogen ions to form a solution with a pH of less than 7, reacts with a base to form a salt, and turns blue litmus red. See also alkali (sense 1) 2. chemistry compound forming covalent bond with base: a compound that can donate a proton or accept a pair of electrons to form a covalent bond with a base 3. drugs Same as LSD (slang) 4. sharpness: a sharp, bitter, or sarcastic quality in speech or writing adjective 1. having acidic properties: with the properties of or containing an acid 2. sarcastic: sharp, bitter, or sarcastic in tone acid comments 3. meteorology polluted: describes rain or snow that contains dilute acid resulting from pollution 4. geology high in silica: describes igneous rocks that have a high silica content [Late 17th century. Directly or via French < Latin acidus < acere "be sour"] -a·cid·i·ty [? sídd?tee], noun -ac·id·ly, adverb The Indo-European word from which acid is ultimately derived is also the ancestor of English acme, acrid, acrobat, acute, alacrity, eager, edge, oxygen, and vinegar.